The pain, discomfort and restricted motion caused by injury to shoulder muscles and tendons have always been well known problems to athletes. In recent times, as more people take up sport and exercise for its health benefits, ordinary people who are not professional sportsmen or sportswomen can find that wear and tear on their shoulder has given them a rotator cuffs injury. Those who participate in swimming, baseball pitching and football are particularly prone to this injury, but anyone who uses vigorous arm movement in any sport or activity can get it. Repeated overhead arm motion is often the root cause of rotator cuff injury - it is the long term and repetitive nature of the motion, rather than one particular jerk or twist of the shoulder which is often the problem. After the injury has been diagnosed, rotator cuff exercise is often recommended to rehabilitate and strengthen the shoulder, and so avoid future injury or rotator cuff tears. This type of exercise should only be done after the pain and swelling have passed, following a period of rest. Rotator cuff exercise programs are more complex than many exercise regimes, because of the number and inter-relationship of the muscles and tendons which hold the humerus to the shoulder blade, and allow the upper arm to perform its full range of motions. Rotator cuff exercise usually incorporates many different individual exercises designed to strengthen particular muscles one at a time. 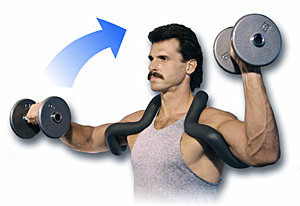 These exercises include holding and raising a light dumbbell, while the elbow is supported; lying on the side and raising a dumbbell toward the ceiling; and (while standing) raising a dumbbell towards the horizontal, holding it with the thumb pointing down.